Quite a few months ago I met up with Mr Spool and we headed down to the river to take landscape photos. Whilst we were walking we came across a yacht club so we decided to head in and see what we could come up with. This old girl really struck me for two reason, she was a bright blue when everything else around her was white and that she was like a dignified old lady in amongst all the ‘new’ boats. Its nice to see these old boats still out and about. 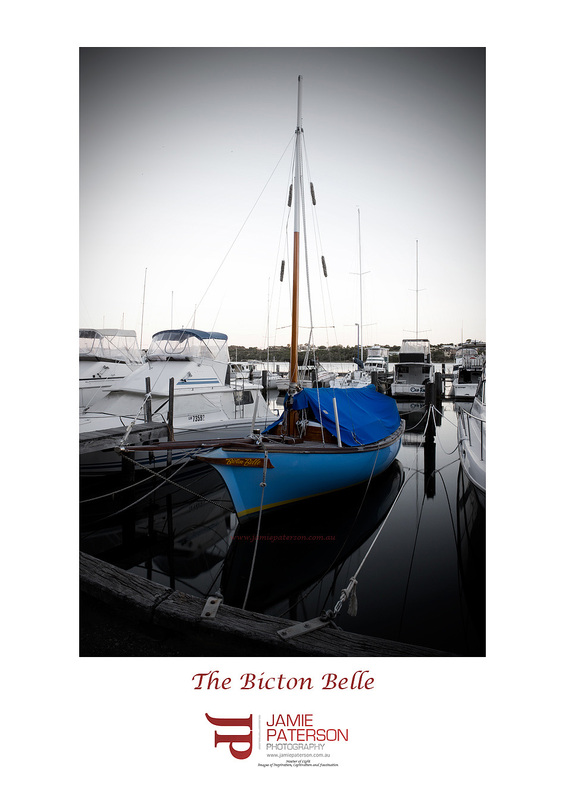 Even her name is such a nice name the “Bicton Belle”. I hope everyone gets a chance to get out and about this weekend and capture some awesome shots. This entry was posted in Australian Landscapes and tagged australia, boat, canon, fremantle, Jamie Paterson, jetty, perth, reflections, river, sunrise, western australia, yacht. Thanks for that. I just love taking photos of boats. Now I just need to get one of my own lol. Thanks for that. Yeah desaturation really seemed to suit this shot. It really draws attention to the boat. How is QLD going now that you’re back? your getting much better results Jamie, has the penny dropped mate, well done. Thanks for the comment much appreciated. I agree that I slowly ‘getting there’ and its thanks to everyones help. Thanks for that. This one was done at East Fremantle Yacht club, she just stuck out like a sore thumb amongst all the new boats. I’m the same, would be nice to sail through the South Pacific islands on a big boat one day.